A game where every puzzle solution is a gun (seriously). Put a new trailer out that you can check out below. Me and brother playing a co-op only level (I'm Signal, he's Static). 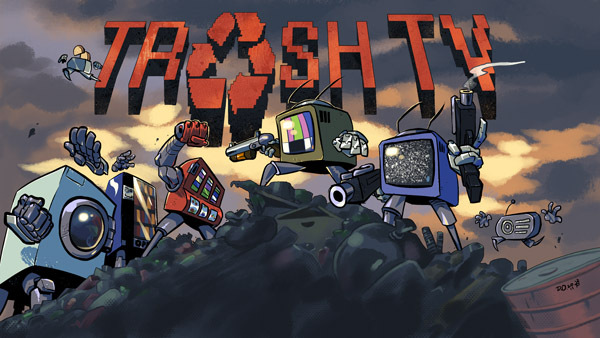 Friendly fire in Trash TV pushes each other back a little which seems innocent enough but can easily be used to push your friend off a cliff, into lava or a rampaging vending machine. Of course you can always get your own back! Split screen is being coded right now and I'll have a new vid soon to show how it functions. An interview of the origin of Trash TV and why sometimes it's okay to clone games. My first interview for my up coming game, Trash TV. Just had a go on it at the London Indies meetup and it's really good. The puzzles are clever and great fun. This game is a load of 'TRASH' not really nice look :P Good luck! i'll track, it seems to be good! ;) Keep up!